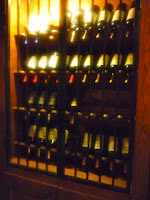 We went to 17 hundred 90 for dinner near the end of Savannah Restaurant Week. During this special time, diners are offered a three-course, prix-fixe menu for thirty dollars. We were dining with good friends who recently moved to Savannah. 17 Hundred 90 is located at the corner of President and Lincoln Streets. Hey, how's that for mnemonic? Say it together a few times and you'll never forget where it is. This inn and restaurant is named for the year it was constructed. The brick walls, crystal chandeliers and live piano music give this place a great ambiance. 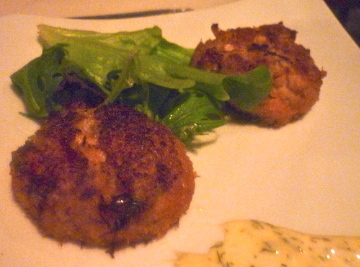 We began our first course choices with crab for the ladies and salads for the men. Miss Annette's Crab Stew was fairly smooth, except for the nice-sized pieces of crab. I considered licking the bowl to get every last drop, but in the name of decorum, quickly reconsidered. Two crispy wafers of jumbo lump crab perched beside a dollop of lemon-dill aioli. They were nicely seasoned and we agreed that not much filler was used in the construction of these tasty cakes. The boys' salad greens were bright and crisp. Mixed greens with a raspberry vinaigrette for one. 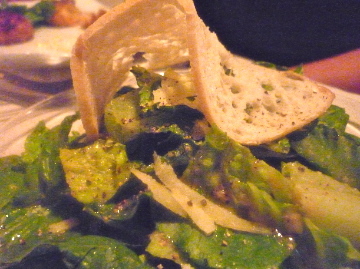 The other salad, a Caesar was tented with a large, toasted ciabatta crouton. Even though the restaurant was busy, we enjoyed the relaxed pace at which our meal was delivered... no Benihana model here. The girls each chose scampi for dinner. 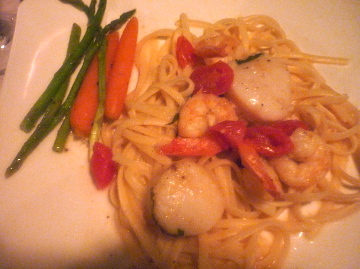 Shrimp and scallops in a light, white wine garlic sauce with grape tomatoes and basil. Tiny whole carrots and asparagus, perfectly steamed came with it. Both guys ordered a form of beef. One settled on peppercorn crusted tenderloin finished with a bourbon demi-glace. 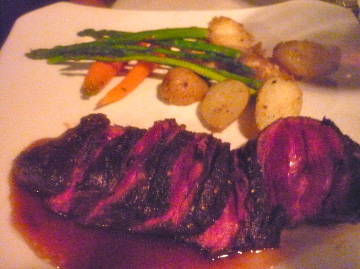 Served with roasted fingerling potatoes and veggies du jour, the steak was melt-in-your-mouth tender. 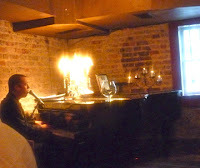 The arrival of dessert was a little delayed, but the piano man had a velvety, smooth voice. He entertained with a little Frank and a little Johnny. When he played Moon River, I felt as though we should all stand reverently with hands on heart. 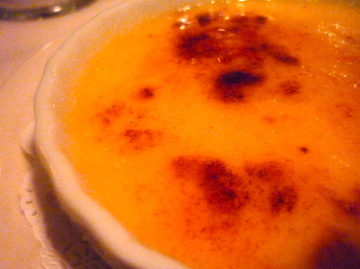 For the sweet and final course, each chose blood orange creme brulee, but were a bit disappointed with it. It had an orange-y creamsicle flavor, but upon discussion, we felt it needed more time to set up and develop. 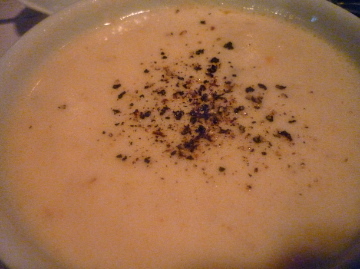 The texture was more like a warm egg custard, instead of dense and cool. Hmm... maybe it was supposed to be like that and merely needed to undergo a name change. On a positive note, the caramelized sugar top was thin and perfectly browned. I adore the crackle-y sound it makes when the spoon plunges in! Piercing the surface of hardened sugar has to be one of the best sounds, ever.